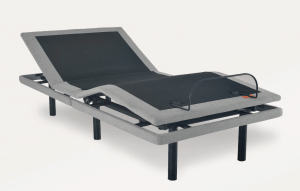 Adjustable Bases for Mattresses: A New Trend? What’s an adjustable base bed? One of the latest trends in the mattress industry is the adjustable base (or as various marketers call them: power bases, ergo bases, lifestyle bases, etc). They have been around in one form or another for a couple decades, but until recently were mainly advertised for health issues. Now that more of us are using electronics in bed, adjustable bases are being advertised more and more to the younger crowd. Additionally, almost all new mattresses these days can work with an adjustable base. Virtually all foam mattresses, most mattresses that use individually pocketed coils, and even some models with “offset” coils that are tied together can work with an adjustable base. There are no downsides to getting an adjustable base except for price. Worst case scenario is that if it does nothing for you, it still works as a foundation. So, here are some benefits. It makes it easier to do things like read a book, use a laptop, or watch TV in bed. (P.S. I don’t recommend doing those last two things. More on that in a bit). It can be comfortable to raise your feet and head up a bit, especially for a back sleeper. The massage feature that the higher end models have is very relaxing. If you have problems with acid reflux, elevating your head can help alleviate that. Elevating the legs is recommended for a lot of sports injuries, like a sprained ankle. It can also help with circulation issues. For older people, raising the head up can make it easier to get in and out of bed. Like I said in number 1, I do not recommend using any electronics or watching TV in bed. Sleep experts say that using electronics and watching TV in bed will lower the quality of your sleep. It’s a little frustrating to me that the mattress industry is saying that adjustable bases will help you watch TV in bed. I don’t like saying that to my customers, because you shouldn’t watch TV in bed. However, if you’re going to do that anyway and ignore the sleep doctors, it is true that an adjustable base will help you accomplish your goals. Whew. I feel good to have that off of my chest. All that said, the other reasons to get an adjustable base are valid, and they will be an improvement to your life, if you can afford the extra money. There is a big range of prices that adjustable bases are sold for, and the higher the price, the more features the base is likely to have. Here is a list of possible features you can get. The ability to raise the head and/or feet up. On some models, you can just raise the head up. On others, you can raise both the head and the feet. Do you want to only raise the feet? Turn the head-only model around, or sleep on it the other way. Massage feature. Models will have between 1 and 3 zones of massage (which is generally just a vibration feature). The most I have seen is 3 zones of massage, but there may be a model out there with more. On some models, you can control the intensity of the massage, and even change the pattern of the massage. Memory positions. Some models will have the ability to save your favorite position and return to it whenever you’d like. These also tend to include a “flat” button to return the mattress to the flat position with one button press. Other advanced features. There are too many advanced features to list here in detail, but the higher end bases will all add their own little thing, like an iPhone app to control the bed, or a preset “zero gravity” position which is supposed to be good for you, or the ability for the feet to actually recline down below horizontal, not just up. How much does an adjustable base cost? The price of an adjustable base depends on the overall quality and how many features you get. On the low end, the cheapest adjustable bases only cost a few hundred more than a regular boxspring and frame. For example, in a queen size, the Falcon by Leggett & Platt runs about $800. A regular boxspring and frame will be about $400. So, instead of buying a queen mattress & boxspring set with a new frame for $1200, you can get the mattress and an adjustable base for $1600. On the high end, you can spend $3,000 for the best adjustable bases. These bases add the advanced features listed in the previous section like massage features and smart control options. Below, I will list a few models in different prices and explain what you get for each. The Falcon is one of the best adjustable bases for the price out there. For under $800 (at the time of writing this), you are able to raise the head and feet of the mattress, plus it has a wireless remote. Many others in this price range either give you a hardwired remote, can only raise the head, or both. Tomorrow Sleep, a direct-to-consumer mattress company owned by Serta Simmons Bedding, has a good adjustable base here. It’s only slightly more than the Falcon above, with similar features, but it’s designed for quick and easy setup and it has a free return policy. You also get a USB port to conveniently charge your phone. It retails for $900 in a queen, but with my coupon code NERD125 you get $125 off (bringing the price to $874 in a queen). The convenience of the return policy makes it a low-risk purchase, which helps offset the slightly higher price. This model available at Amazon has just about anything you could ask for in an adjustable base as well as a 20 year limited warranty. It has an adjustable height off of the ground, a zoned massage feature, an “anti-snore” feature in which the bed will adjust slightly to break up whatever position is causing your partner to snore without waking him or her up, a preset “zero gravity” position, and a programmable remote. This is one of the best on the market, and it’ll run you about $1500-1700 for the queen size, depending on current sales. There are other models for even more, but I don’t feel they add too much to be worth the extra money for most people. An adjustable base is a great way to enhance your sleep experience. If you’re already getting a good mattress, you can make it even better with an adjustable base. If you’re getting a low-end mattress, you should take the money you would otherwise spend on the base and use that for a better mattress instead. But, if you already have a good mattress, or are about to buy a nice mattress, and you can fit it in your budget, an adjustable base is a great idea. Don't get overwhelmed with the choices. Here is your guide for finding the best mattress. One often overlooked piece of the sleep environment is your sheet set. Here is what you need to know. Tiredness is assigned to arthritis, so it’s your decision for top level sleeping you can every night Purchase a mattress that helps to keep you comfortable while helping your aching joints. In case you have trouble getting out of bed every morning, think about bed furniture which increases you into a sitting place. A fantastic hint for handling many forms of cancer is to anticipate the physical alterations you or your family member should go through. If you research what will take place with the form of malignancy and treatment method, you will understand what to prepare for and may prepare yourself mentally to the changes that can appear. Continue to keep an symptoms of asthma log to assist you determine elements that set off episodes or aggravate signs or symptoms. In this particular log, monitor food products and routines to assist you to pinpoint those things that cause asthma attack assaults. Your bronchial asthma record is also advantageous when working with your personal doctor on your own long-term managing plan. There may be nothing quite like a good mug of coffee if you are experiencing slow and discouraged. Merely the aroma of espresso can perk you up. By being familiar with caffeine, you may love your following mug. This article will discuss a number of exciting bits of details about this beverage. When it comes to men’s jewellery style suggestions, it is important to take into account the truth that males should never put on large metallic charms. These are generally Fine for women, yet not for men. Instead, opt for something small and straightforward or go with natural leather alternatively. Rubber or plastic material charms are for youngsters. Improve your tooth brush each and every 8 weeks. Trying to keep 1 over this is just releasing germs to your jaws, which can be in contrast to the goal of cleaning. In case you have a toothbrush by using a removal mind, just alter the head each 2 months. Anything used in your mouth more than this is high-risk. mind that how a user can be aware of it. Therefore that’s why this piece of writing is perfect.